Buy 'Hands' - my new recording with Dave Binney, Tom Rainey, and Chris Guilfoyle! 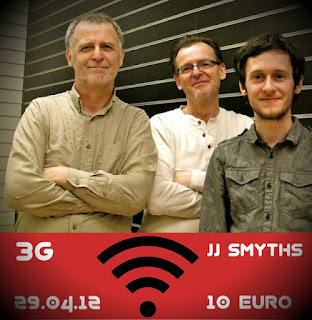 This Sunday sees the debut of 3G – a trio consisting of myself, my brother Conor, and my son Chris. Strictly speaking this isn’t the first gig for this trio, we made our actual debut about 8 years ago, at the 50th anniversary concert of Chris’ secondary school – one of those celebratory school concerts featuring amusing anecdotes concerning teachers and pupils of bygone days, earnest speeches and excerpts from musicals. We were on the bill because both Conor and I were also past pupils of the school, and featuring this trio of current and ex-students on the concert probably seemed like a good idea to the school authorities. They may have altered that opinion when we came onto the stage of the National Concert Hall, played completely free for a while and then played ‘Left End’ - a gnarly rock-influenced nugget written by Rick Peckham. Chris’ schoolmates loved us, but there were many raised eyebrows among the assorted bishops, parents and school dignitaries – true subversive fun. We’ve been rehearsing regularly for the past few months and it’s been a lot of fun. There’s a very nice dynamic in the group – obviously Conor and I would be a lot more experienced, but Chris has been around music in general, and this kind of music in particular, all his life, so he knows what the general vibe is and the way we think about a lot of stuff. He came through the Newpark Music Centre BA in jazz performance programme that we both teach at, but I did very little direct teaching of him while he was there – firstly because he probably got more than enough of my opinions at home, and secondly I felt it was good for him to be exposed to the techniques and opinions of other teachers and musicians. He’s also followed his own way outside of the jazz world, playing in various punk bands from an early age. But of course he grew up in a completely musical environment, and a mostly jazz environment, so when it came to the time to put this group together, there’s little for us to talk about in conceptual terms – we’re all broadly in agreement of how the music should go. And the music we’re playing? Well, in a way some of it is a throw-back to the Guilfoyle/Nielsen Trio days – lots of odd metre stuff, a love of intensity, extremes of tempo, virtuosity, rhythmic complexity, lots of swinging, standards and originals approached from a similar vantage point – a desire to burn! In this group we’re consciously espousing the more physical aspects of contemporary jazz – there is very little ‘in the middle’ kind of stuff, it’s all or nothing – no wishy-washy-ism allowed. It’s definitely connected to the old GNT way of playing, but it’s different too – Chris is a different guitarist to Mike Nielsen, and Conor and I are further down the road of our own musical development since those heady days of rhythmic discovery twenty years ago. Of course on a personal level it’s great to be playing with my son – but it’s great on a musical level too, because Chris will really contribute something individual to the band and get something different out of Conor and I. This will be the first of many trio excursions, as we’re determined to develop the music and the band over the coming months. If you’re in Dublin tomorrow night (April 29th) come on down to JJ’s and check it out. If you like committed, swinging, virtuosic and creative music, then this is for you. Here’s a taste of what we’re going to get up to……….. Thanks for visiting - this is a blog about creative music, or music related issues. Feel free to comment if you feel disposed to. but please identify yourself, even in a basic way, if you wish to respond. You can do this very simply either by creating a blogger identity, or by using some other means of letting the world know who you are! We should all be prepared to stand over our opinions and I'm a bit reluctant to post 'anonymous' comments. Also, I won't post any responses that contain 'flame'-type comments about anybody. I'm not interested in personal attacks on anybody, so please, by all means express your opinions, but keep it civil. If you enjoy some of the posts here (and I hope you will!) and would be interested in being kept updated when new ones are added, just click on the 'Follow' button above this message and it's simplicity itself to be advised of any updates. Dualism aside . . .